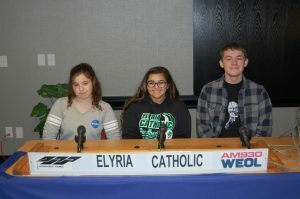 With competitions taking place for the first time at the Elyria Hampton Inn and Suites, the first program of the season features the following teams: from Elyria Catholic High School, pictured left to right, Elizabeth Parkey, Ivelysse Gracia, and Nicholas Ziegelmeyer, and the academic team from Oberlin High School, represented by, left to right, Ario Thompson, Nicole Bertoni, and Risa Jackson. The program first aired on January 28, 2019. Click above to listen to the competition. (Note you have the option to open it in a separate window, allowing you to continue browsing the web as you listen.) You may click on our official news release for a (spoiler! )summary of the final results.